We introduced the Evos® playsystem in 2007, and since then kids around the world are finding new ways to play on the innovative playground. While lots of kids describe Evos as a “spider web” or “spaceship” playground, parents and adult supervisors know that it’s a workout disguised as fun. And not only does Evos exercise kids’ bodies, but also their brains.With more than 25 playground components, Evos offers endless configurations for your playground. Even more, we’re constantly introducing new products to keep it fresh for kids. 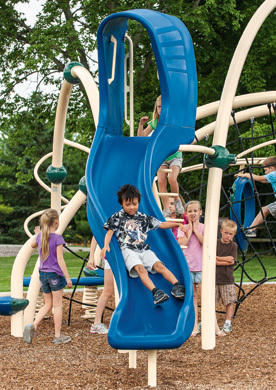 In late 2012, we introduced three new slide options that can help add new life to your playground design. The three new slides—Rush™ Slide, Surf Slide and Surf Stainless Steel Slide—join the Hang Glider™ in offering a truly unique and thrilling ride to the ground. The Rush™ Slide has an integrated slide hood and transition platform specially designed to help channel kids into a safe sitting position. The Surf Slide includes protective barriers and a unique slip resistant, marine-grade deck surface to keep kids safe. The Surf Stainless Steel Slide has the same safety features as the Surf Slide with the polyethylene slide bedway, but the stainless steel bedway does not emit a static charge, so is a good choice for kids with cochlear implants. 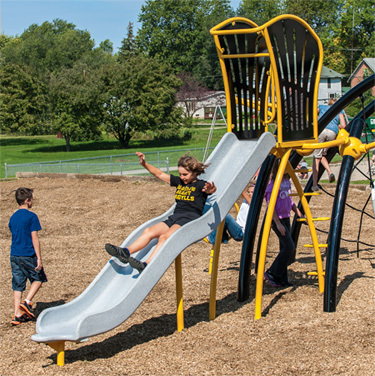 Learn more about Evos, and how you can create an Evos design for your playground that will keep kids active and engaged during recess or on visits to the local park. This entry was posted in Play, Playground, playgrounds and tagged Evos, parks, playground slides, recess by PlayLSI. Bookmark the permalink.